Ta Da!!! This is the first guest post on my blog. 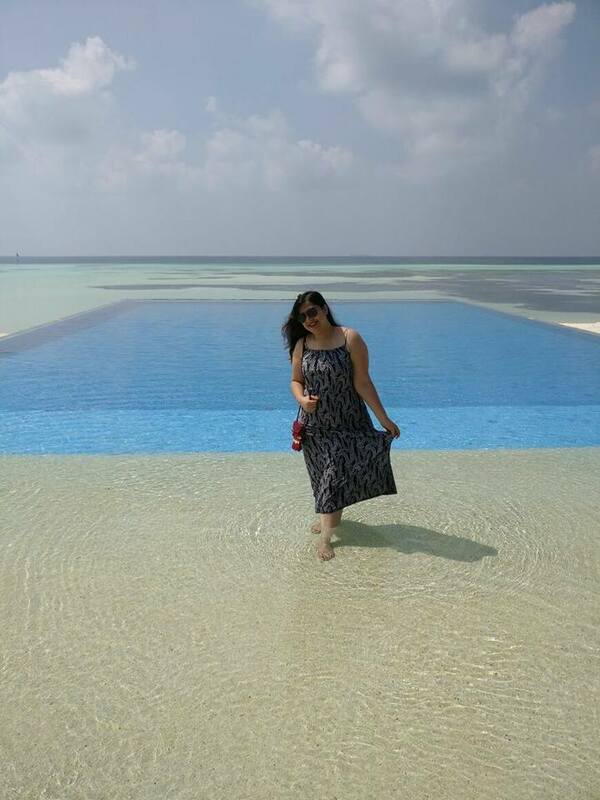 *Drum roll please* My dear friend, Salwa Musani, had this amazing vacation in Maldives that she was documenting on her Facebook page. I convinced her to do a post for this blog as I loved her detailed explanation. And…. she did it for me and for all of you! How adorable is that! I hope you find it useful. All information and photographs are provided by Salwa. I was in Maldives during Christmas this year for 5 days, and at the risk of sounding too cliche, it really was Heaven on Earth. When I posted pictures of where I was, a lot of people started asking me details of where I was and which resort I was staying at, so that they could someday visit too. Hence I'm penning down all the details that I know (and can remember) about Maldives. We flew to the Male International Airport (formally known as the Ibrahim Nasir International Airport) from Kuala Lumpur on a Tuesday evening. It was a 4.5 hour long flight and Male is 3 hours behind Malaysian time, so although by the time we got there, it wasn't very late in the night yet, but we were exhausted. The major currency used and accepted in Maldives is the USD. So it'll be a smart move to get your local currency exchanged to USD before flying to Maldives. You could also use the Maldivian Rufiya of course, but for me, I could not find a currency exchange in KL that had the Maldivian Currency, and similarly, when you land at Male Airport, they would not be able to convert the Malaysian Ringgits to the Maldivian Rufiya (because some don't even recognize the ringgits). Since all the prices in Maldives are quoted in USD and everyone accepts the USD as a currency, you would not even need to have Maldivian Rufiya on you as long as you have the USD. 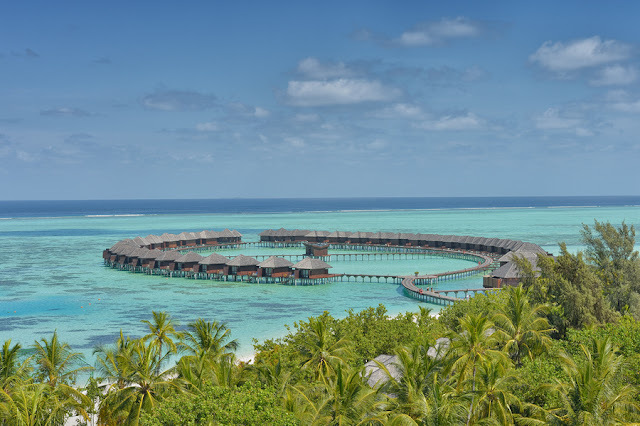 The important thing to know about Maldives is that unlike most countries, it is not one big country, but instead, it is made up of over a thousand little Islands scattered all over the Indian Ocean. However, only about 200 or so of these Island are inhabited. The airport in itself takes up a whole island, and if you check Google maps, you would see that the runway of the airport alone starts from one end of the island and ends at the other end. So there is no place for anything else on that one Island except for the airport. Male, the capital city of Maldives is another small island which is about a 10-minute boat ride away from the airport. In any other country, you would have public buses or taxis, but in Maldives, you have public ferries and boats that are the normal mode of public transportations. 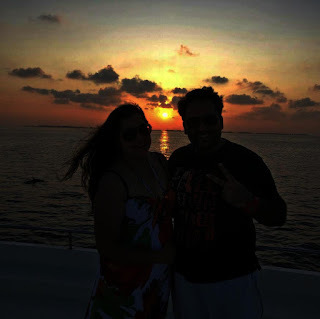 Once we landed at the airport, we were granted visa on arrival (Pakistani passport; You may check visa requirements for your passport), and once we got through the customs and immigration, there was a very friendly attendant from the resort waiting for us who led us to the jetty. From there we had to take a 45-minute speedboat to our resort. During our five days in Maldives, we did not have time to visit Male because we wanted to stay at our beautiful resort for as long as we possibly could. The name of the resort which we stayed at is Olhuveli Beach and Spa Resort. Again, this whole resort takes up one entire Island, and you can walk from one end of the Island to the other in about 10 - 15 minutes. That is literally how small each island is. When planning a vacation, we would first usually decide on a destination, i.e which part of a certain country we wanted to visit. For instance, if we want to go to Australia, we would decide if we want to fly to Sydney or Melbourne or Perth depending on which place is more beautiful or appealing to you. But when planning a vacation to Maldives, we could not choose the location based on which Island was the most beautiful, or the biggest, or closest to Male. 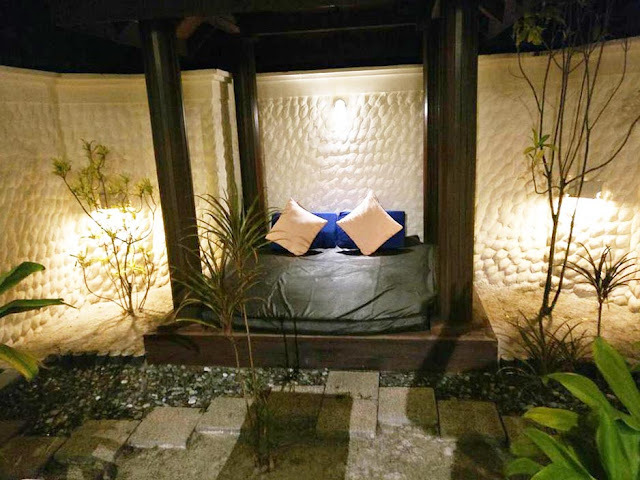 Instead, we had to choose a resort first, based on our budget and availability, because you cannot go to an Island without staying at the resort. Some people prefer four or five star resorts only, while others are fine staying at budget hotels. So if you choose an Island first, that Island might only have one resort on it, and it might not be to your liking. Because the islands are so small, each island is a resort on its own. This is why you choose a resort first, not the island. We were lucky that our resort was near enough that we could go there by speedboat. Some resorts are so far from the airport that once you land at the airport, you have to take another seaplane to your resort. For those of you who have never been on a seaplane before, it might be a good and worthwhile first experience, especially since Male airport is one of the most scenic airports in the world. So this could be a factor in deciding which resort you would like to stay at. However, bear in mind that a seaplane could cost anywhere from 200 - 600 USD per person depending on how far your island is from the airport. Another point to note would be that when booking a resort, you would normally have the option of half board (which is inclusive of breakfast) and full board (which includes breakfast, lunch and dinner). Since the only place to eat on the island would be one of the restaurants in the resort, and each meal could easily cost you around 100 - 120 USD, it would be a much wiser decision to go for the full board option. Almost all the locals in Maldives live in Male and the rest of the Islands are mainly resorts just for tourists. Like our Olhuveli resort was just full of tourists and the only locals there were the ones who worked there. However, for some people who prefer to see how the locals live in Maldives, there are a few bigger islands like Maafushi where half of the island is a resort for tourists while the other half is inhabited by locals. 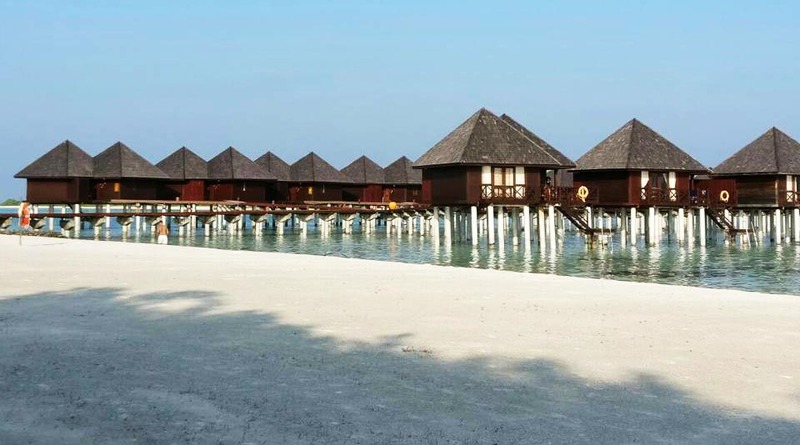 The interesting thing about Resorts in Maldives is that because they have so little land and a lot of sea between the islands, a lot of the resorts would have water villas for guests to stay in, which are literally villas standing on top of the sea. There would also always be a staircase leading from your water villa to the sea directly. Although we stayed at the beach villa (which was literally on the beach with our balcony facing the sea), we were upgraded to the water villa during our last two days at the resort. Staying in the water villa was magical. It felt like we were living in a huge aquarium, with wild sea creatures all around you. Another thing which I found very interesting was that each island in Maldives operates like a country on its own. They produce their own food and drinking water, generate their own power, have their own sewage system, have their own hierarchy and organisational structure, and for food that they are not able to produce on their own, they import it from Dubai approximately twice a week. I take pride in the fact that I have been to a lot of islands in my life. I can easily say that I have been to almost all the Islands in West and East Malaysia and some in Thailand (which are supposed to be some of the best in the world). So I assumed that nothing could surprise me anymore. 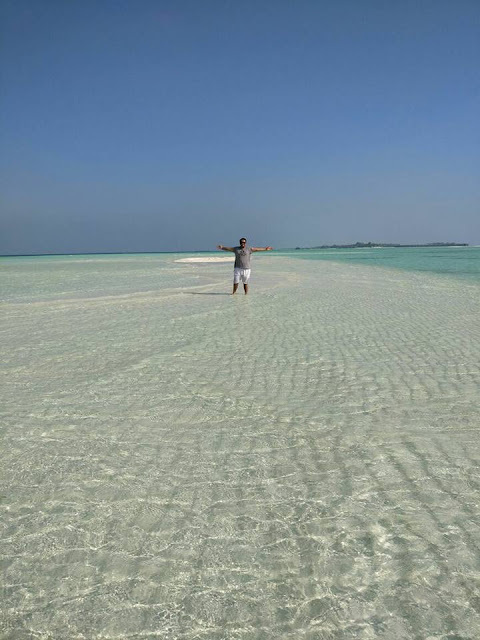 But when I reached Maldives, the clear aquamarine waters and white sand took my breath away. It was like nothing I had ever seen before. The ease with which you could see fish and all sorts of aquatic creatures in the water was something out of this world. I can without a doubt say that it is the most beautiful place that I have ever been to. Also, in all my times of travelling to islands, I had come to realise that all islands and beaches have a specific smell to them, and not all of them are pleasant (especially when you have to take a boat from a jetty). However, these waters were completely odourless, which was new to me. Although I have spend my whole life in Malaysia, my hubby has spend a good decade or two in Lahore, Pakistan. So, on our second day in Maldives, when it started raining for about 10 minutes or so, it was a nuisance for me because I could not go for water sports, but hubby got all nostalgic and said that this is what rain smells like in Pakistan. Similarly, when we went for a long cruise on the Indian Ocean (very far from where our island was which had no specific smell), he again became nostalgic and said "This is what the sea in Pakistan smells like". I could not relate because I had only ever known the smell of the sea around South East Asia. But I was glad to have had these experiences with him which made me understand him better. Like all Islands, our island resort had a number of water sports, activities and excursions to choose from. On our second day, we went for snorkeling and diving. And I am not exaggerating when I say that we were able to see hundreds of sea creatures when we dove underwater, from fish of all shapes, sizes and colours (including baby sharks, stingrays and electric eels) to jellyfish and turtles and crabs. Not to mention the shapes and colours of the underwater corals and seaweeds which were so hypnotic and mesmerising that you felt like you never wanted to come out of the waters. It felt like an episode from the discovery channel or national geographic except much much more beautiful. The next day, we went on a cruise to find dolphins until dusk. Because it was a very expensive cruise, we were warned multiple times that there is no guarantee that we would actually find any dolphins so we should go at our own risk, and that even if we do not see any dolphins, at least we could enjoy a romantic sunset on the cruise. 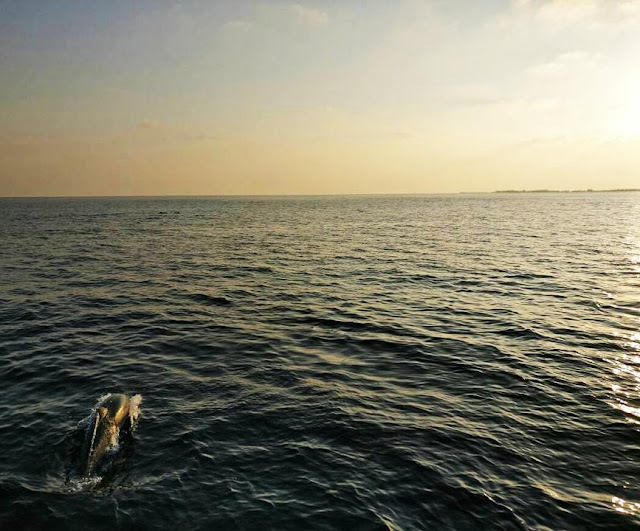 We took the risk and went anyways to look for wild dolphins, even though the people who went for the same cruise the day before us did not manage to spot a single dolphin. We were on the cruise for a long time until suddenly, our guide who was looking through his binoculars shouted "look, dolphins". And lo and behold, in a matter of minutes, we were able to see not one, not ten, but hundreds of dolphins swimming with us, close enough that we could touch them. They were jumping and diving with such grace and poise that it looked like they were putting on a show just for us. And mind you, these were not tamed and trained dolphins, but they were wild dolphins in the open sea. I came to realise that dolphins really are one of the most friendliest creatures I have ever seen. I want to add here that dolphin hunting is strictly prohibited in Maldives, and there is a huge fine imposed on anyone caught hunting dolphins for consumption or otherwise. All you're allowed to do is observe them in their natural habitat in all its glory. The next day, we wanted to do some more water sports and because jet skiing and parasailing were too common, we decided to try the catamaran. I don't know if any one of you has ever heard of or been on a catamaran before, but for me, it was an entirely new adventure. A catamaran is nothing like a regular boat. Instead its like a surf board, but bigger, with a sail and no seats. So you sit on a hard, flat surface holding only a piece of string and sailing to wherever the wind takes you. 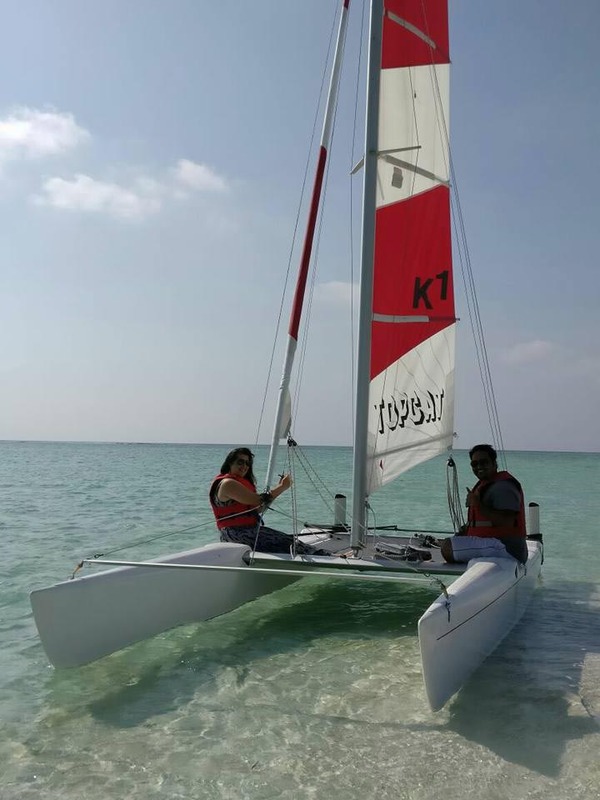 Only a maximum of two people can fit on one catamaran (and a skipper, who is the person sailing it in the right direction). At first I was very scared because the waves were so strong that it felt like we would fall at any moment into the deep, open sea, and we had literally nothing except a life jacket for safety. 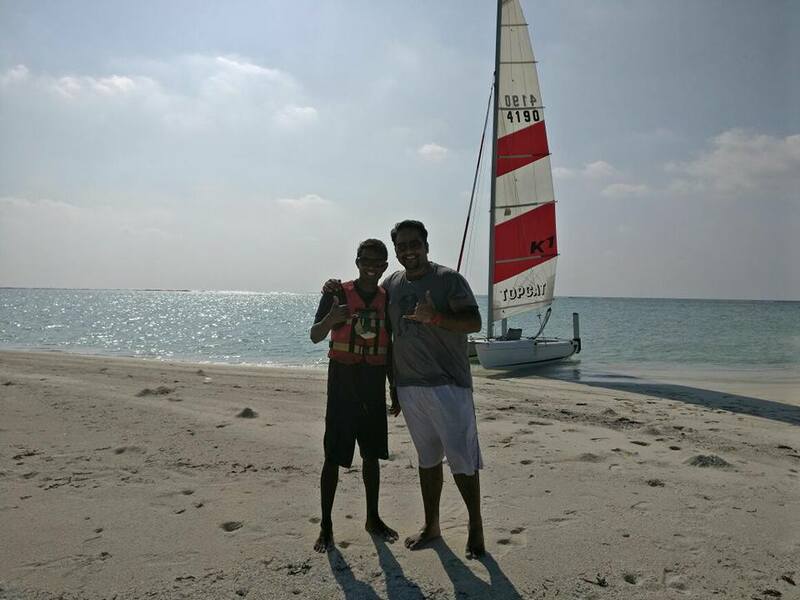 But after I got the hang of it, I started to really enjoy it and wanted to try my hand at sailing too. We sailed all the way to a sandbank, which is a very small piece of land literally in the middle of the open sea. Sometimes during high tide when the waves are strong and ferocious, even that small piece of land gets entirely covered by shallow water. So if you're standing in that shallow water, and someone riding on a boat nearby saw you, he or she would think that you are walking on water! Probably the only thing that we were not able to do during our stay in Maldives was dining at the underwater restaurant because it was too far from where we were staying. Do comment and let me know if I've missed out an important piece of information or if your experiences in Maldives have been different. The photos are incredible. I cannot believe how clear the water is. 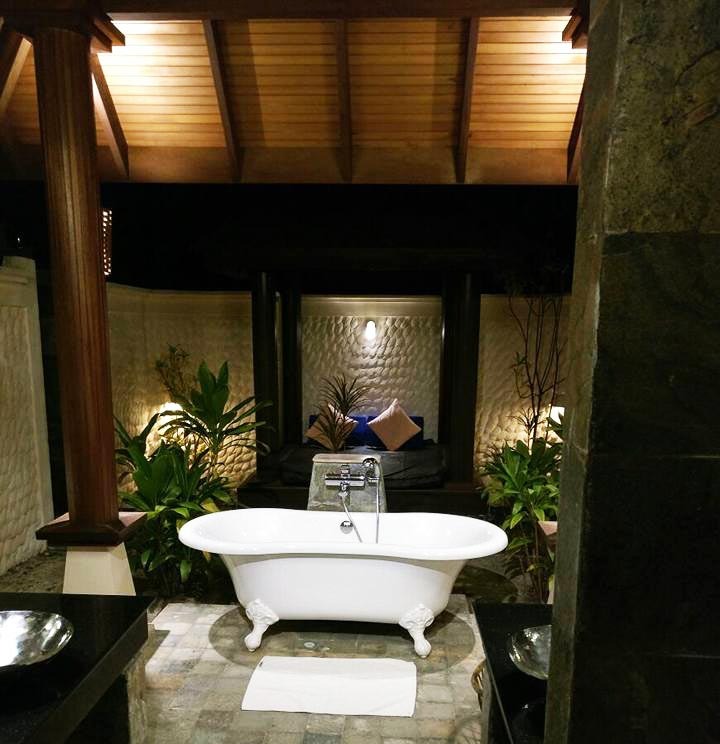 I need to go here for a relaxing vacation! Thank you for sharing this with us. Simply breathtaking! I'm actually speechless. The scenery is out of this world. I wonder when could I have the chance to frolic in this beauty. Maldives...on my wishlist for long time! 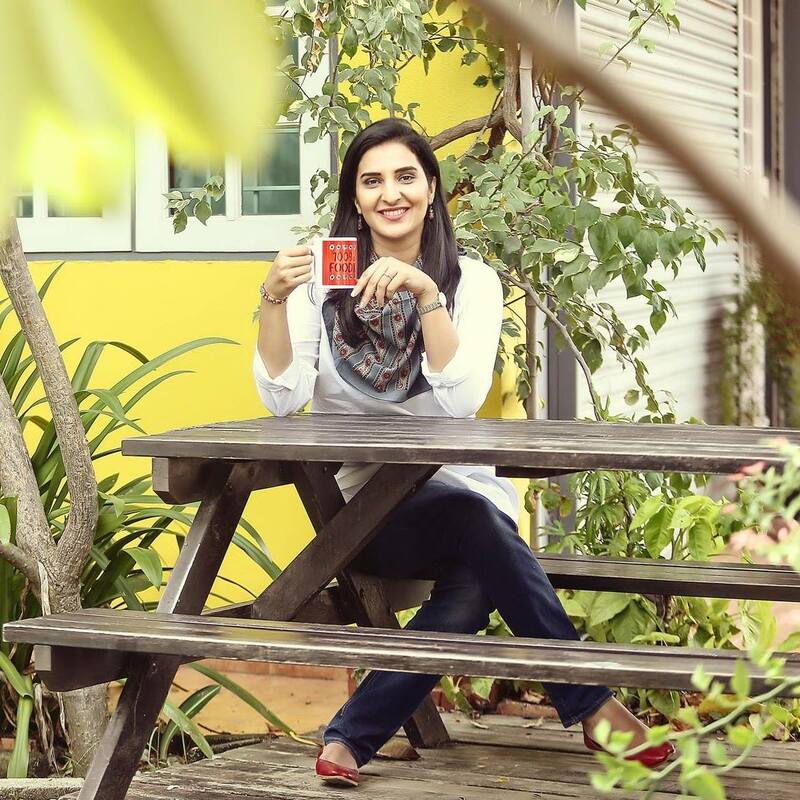 Great to see guest post on your blog...Nice pics! Maldives is so naturally beautiful. I should plan a vacation there too. Maldives looks like heaven! Public ferries and boats as the main transportation is unique since we are mostly used to travel by car on land. This is a must-visit destination for anyone who loves nature and sight-seeing. Wow, the trip looks really luxurious! Thanks for sharing your experience~ Hope you try out blogging more often! :) And Happy 2017! Very detailed report and very nice photos indeed! I will refer back to this if we plan a Maldives trip in the future. Wow Maldives is a paradise. I love the photos and the way Salwa describes it. It seems that she and her boy have had an amazing time there. Congratulations for your first guest post on your blog. Happy new year! Oh my dream beach.. How I wish I could stay there for a few days... I need Vitamin Sea! 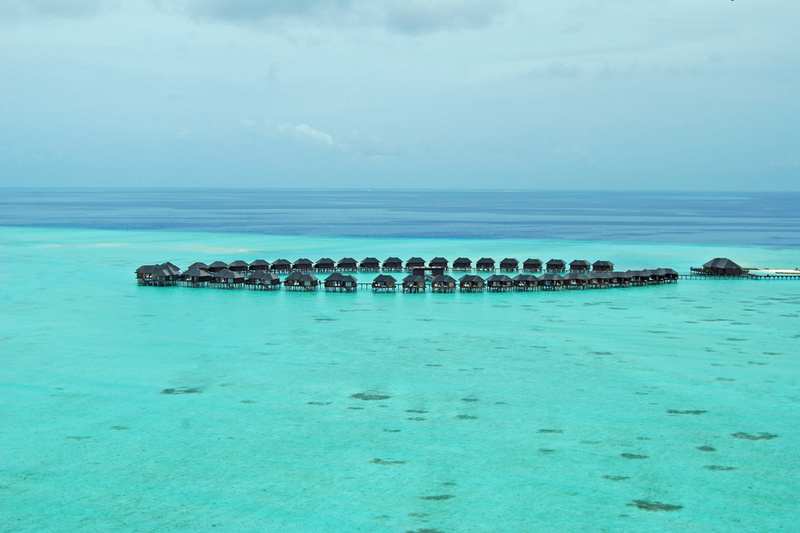 Maldives seems truly one of the amazing wonders of nature. The water has beautiful hues of blue. I hope I can go there someday.